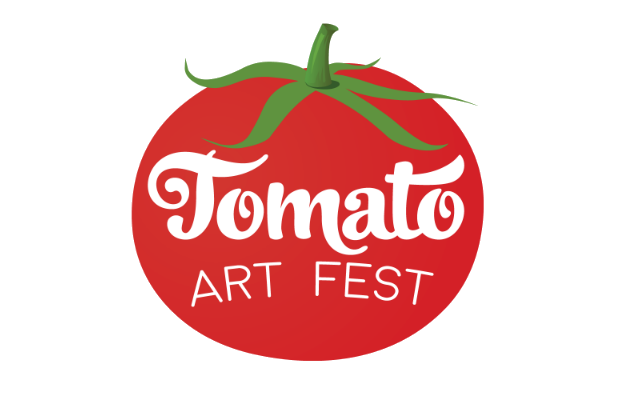 For over a decade, Tomato Art Fest has been a quirky, beloved East Nashville staple, celebrating the local music and art community with tons of artisan vendors, free live music, vaguely and outright tomato themed activities, and more. The annual event returns this weekend, Aug. 12, with a special Kick-Off Concert and various early activities slated for Aug. 11, and per, usual, you can expect the annual parades, games, 5k, and more on Saturday. 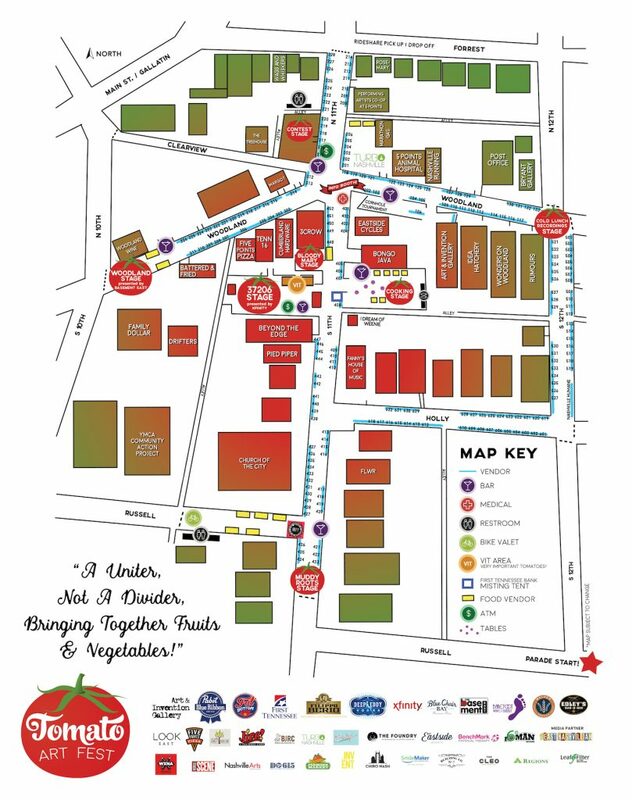 Additionally, this year Tomato Fest is going for a Guinness World Record for “Largest Gathering Of People Dressed As Fruits/Vegetables,” which takes place Friday at 6 p.m. for those who want to make history. Want to be a part of the party, but don’t have anything to wear? Head on down and they’ll get you set up. Of course, we love all things Tomato Fest, but we really go nuts for the musical lineups, which are always free and all ages. This year’s event features the Friday Night Kick-Off Concert, which takes place in the parking lot beside Beyond the Edge at 7 p.m., as well as four stages packed with action throughout the event grounds on Saturday. With this much music to chose from you will surely find something that your big tomato heart desires, whether it’s pop, indie, folk, punk, or something in between. 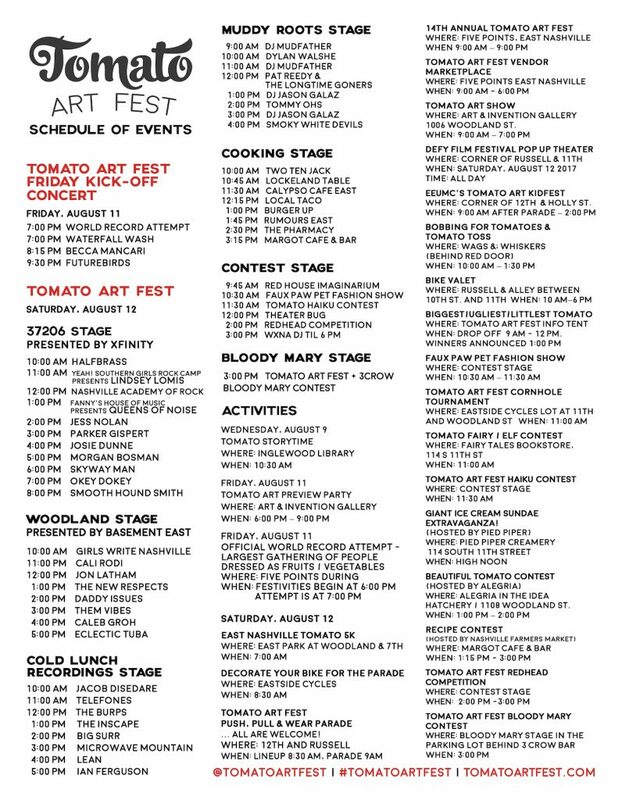 Below, check out our guide to the entire musical lineup, complete with stages and times, a map, and a full schedule, and be sure to visit Tomato Fest’s website for everything you need to know about the whole event. With all of the activity on Saturday, Tomato’s Friday night preview activities can sometimes be overlooked, but free music is always an enticing option in our book. The lineup is lean but stacked, with Americana-tinged Athens indie rockers Futurebirds, budding local alt country star Becca Mancari, and our buds in genre-bending, poppy, punky, indie outfit Waterfall Wash.
Saturday’s main stage, nestled centrally in the parking lot beside Beyond the Edge, is looking pretty stacked, but with so much great music spread across all four stages, it’ll be hard to stay planted at any one spot. Buzzy Americana duo Smooth Hound Smith, psych/soul newcomers Okey Dokey, James Wallace’s new project Skyway Man, and a teen tribute to The Runaways, Queens of Noise, are among the highlights. We never thought we’d see breakout grunge pop trio Daddy Issues on a lineup like Tomato Fest, but there they are, and we couldn’t be more stoked. 2017 is wild y’all. Also making the Woodland Stage a solid, albeit all over the place, bet are folk singer-songwriter Caleb Groh, Americana rockers Them Vibes, and Americana leaning singer Jon Latham. The most rock leaning stage, no surprise since it’s hosted by our friends at Cold Lunch, is headed up by psych rocker Ian Ferguson, dreamy alt pop/punk outfit Lean, jangly, retro indie popsters Big Surr, and more. Basically, if you regularly dig the bands we cover, you could safely hang at this stage all day and have a blast. The Muddy Roots crew also have a curated stage, and it’s a great reflection of the country and rockabilly leaning acts they host at their festival and various other events. Southern blues rockers Smoky White Devils take top billing, and with a couple of DJ sets between acts, you’ll also find talent like alt Americana rocker Tommy Ohs, and more!